eLEAD is using Smore newsletters to spread the word online. Opening a world of possibilities! eLEAD 2017 is Seeking Local Innovators! Are you implementing cutting edge strategies in your classroom? Have you gained new tech skills this year you want to share? Do you integrate innovative STEM or educational technology skills within your content area? If so, eLEAD 2017 needs YOU! 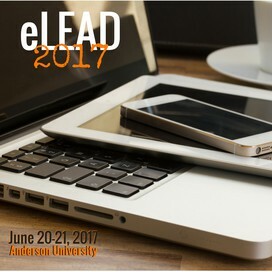 eLEAD 2017 is an educational technology conference presented in partnership with the public school districts of Madison County, Indiana and Anderson University. The conference will be held on June 20-21, 2017 at Anderson University in Anderson, Indiana. The event will focus on preparing educators to implement a technology rich learning environment and with strategies to equip students with the twenty-first century skills they need to be college and career ready beneath the strands of Leadership for Innovation, Engaged Learning, Assessment and Accessibility, and Digital Literacy (LEAD). All applications are due NO later than February 28, 2017!